It has long been known that a grain of barley is of paramount importance for the maintenance of optimal health - rich in plant fibre, it lowers cholesterol and promotes the work of the digestive tract. However, modern research increasingly points to the healing powers of the young barley grass. It was discovered that young leaves of this plant, Hordeum vulgar, are so rich in micronutrients, minerals, amino acids, vitamins and growth factors, that the barley grass juice, obtained from the first leaves that emerge from the ground, is now considered as a phenomenal supplement exceptionally because of its high nutritive values. In the following article we will find out a lot more about this plant. Barley plant as a medicine since ancient times. That the young green leaves of barley are extremely healthy, was found out by the Japanese decades ago, who thanks to the research of professor - Joshihedea Hagiwara, who found that barley grass is a concentrate of active substances, the same ones that we resort to in order to improve our nutrition and health. To be fair, beneficial effects of this plant were first discovered in cows - those who ate fresh grass in the fields of barley were giving more milk, they felt better and fell ill less, and the milk for their offspring was much more nutritious. How the grass became food? Barley together with spelled, and wheat is the protagonist of the Neolithic agricultural revolution that happened 10 to 12 thousand years ago. At some point in the period of "fertile crescent", as well as in Tibet and China, men and women have begun to grow some grain including barley grass which had a very important place in the everyday diet. It was a great discovery, since their seeds were a great food; they gave the energy and could be stored in barns to be consumed during the winter. They have come to serve in the preparation of bread, which until then did not exist in the human diet. That the barley grass is healthy was well known by the Native Americans, who ate not just grains of wheat, but the young plants as well – they used it to treat a number of ailments. The proof that this is no accident is demonstrated by the fact that Chinese from the famous Ming Dynasty used this plant for the same purposes. For them, these young leaves represented a refreshing drug which was very appreciated at that time. History is very long; we could mention the farmers from the American Midwest, who in the twenties witnessed increased production of eggs from hens which were fed by grass crops. Barley grass had a very important role in poultry nutrition; because of it hens lived longer and gave more eggs. So, do you need any more reasons to include it in your diet - we believe that anyone who wants to lives a healthy life needs to use barley grass juice. Also, its leaves can be added to your favourite salads or used for the preparation of the mentioned healthy green juice. Barley grass can be easily grown at home, and if you want you can do it on the terrace, in pots. It is enough just to plant a seed and that is it. Barley is easily grown; there are various types of grains including the ones used to make beer. Barley grass and wheat can be grown in the garden, in front of the house, very simple. First of all you should obtain appropriate seeds. If you put extra energy and engage in the cultivation of it, you will succeed. First, barley seeds are kept in the water for 12 hours. After that you pour out the first water and wash the seeds twice in a day, with exposure to light. You will see that after two or three days the grains will begin to sprout. When this starts to happen, place the seeds in an organic humus or compost and water it, sheltering it from the sun for the next two to three days until the first young leaves start to appear. If you are an expert, feel free to experiment. In order for barley grass to grow nicely, to a large extent depends on the seeds, as well as the climatic conditions. Do not be disappointed if the first "crop" does not work out - it happens to many people, be persistent and try again. For more details, we recommend you a book by Barbara Simonson "Barley grass, a healthy drink" (New Technologies). Here is what the scientific studies have showed about the first leaves of barley, which are harvested immediately after germination. They are used to make an extremely healthy juice. To slow the aging, supposedly you should take growth hormone. We do not recommend it, unless you know a doctor specialist, who would out of justified reasons prescribe such therapy. It is better to start off with fitkocomplexes which are largely contained in wheat and barley grass. They are rich in substances that can stimulate the pituitary gland to produce this hormone in a more natural and safer way. Barley grass is part of the foods that help in eliminating toxins. Professor Hagiwara showed that this complex breaks down pesticides, chemical additives and preservatives in food. This occurs mainly due to the enzymes represented in the leaves. Barley grass contains a powerful blend of antioxidants. Studies have shown that the juice is extremely rich in these compounds. Barley grass juice contains important anti-inflammatory substances, such as superoxide dismutase (an enzyme) and chlorophyll. It has been proved that it helps in the case of chronic inflammation of the pancreas. It is known that barley grass contains eight essential amino acids, which our body itself is unable to synthesize. If organic it can contain a greater amount of vitamin B12. This plant synthesizes vitamin B from bacteria in the soil, if we bombard it with pesticides, we will sterilize the earth. This delicate little plant has a powerful healing effect: it is rich in nutrients, purifies the blood, lowers cholesterol and slows down aging, and in many ways can be beneficial to your health. Experiences with the barley grass juice are more than good and on this occasion we would like to share with you this simple recipe. 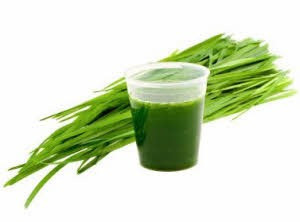 For a quick green barley grass juice, a top multivitamin drink, you will not need a lot of time, and you already have the ingredients in your household. Barley grass powder (1 teaspoon). Squeeze out the juice from the apples and oranges in a juicer, and finally add barley grass. In the end, we will mention the famous Hippocrates tea, which confirms the healthy properties of barley. This tea is traditionally attributed to the famous Greek physician, although there is no evidence that this is indeed his – probably it is even a few centuries older. About 40 grains are placed in one litre of water to boil. It should be heated for 30 minutes, then filtrated and drunk three to four times per day. It is considered an invigorating beverage that acts against inflammation and stimulates digestion, a tea made from barley is recommended during the recovery period from an ailment. As you can see, barley and barley grass are widely used in phytotherapy, whether used as a tea or juice. NOTE: It can be found in herbal pharmacies as a barley grass powder, you can buy it as an already finished product. Prices vary and are not for everybody’s budget namely because 100 grams costs from 14 to 17 dollars. Before embarking on this purchase, you should gather more information about the product and its manufacturer. Read about the experiences of people on numerous internet forums and web sites that deal with alternative medicine.